Not a great deal happens in east Donegal by and large, but one of the more bizarre stories of last week happened a couple of miles down the road from me. 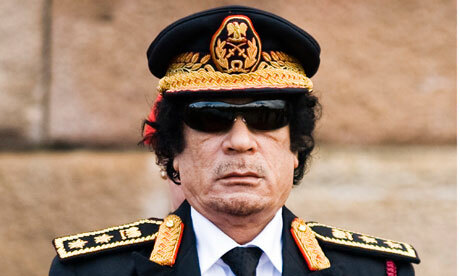 At Sunday Mass in Raphoe last week Fr Dinny McGettigan, in addition to praying for the recent dead, also prayed for Colonel Gadaffi. It raised a few eyebrows elsewhere in Ireland, and indeed beyond, but it didn’t surprise me at all, because I’ve known Fr Dinny for years. In fact, he was my school chaplain at Deele College in Raphoe for five years. He was my religion teacher for the last two, running classes that had a satisfying catechism : talking about football ratio. In the area he is known mainly for three things: power-walking with a luminous vest on, getting people’s names mixed up (he called me Seamus for extended periods of time) and being the most relentlessly Christian man there is. A couple of years ago, he was attacked in the middle of the night by a burglar who stabbed him several times in the head and chest. Once well enough again, he went to the assailant and told him he forgave him, and pleaded leniency when the case came to court. I’d never heard anything like that before and haven’t since. The reason I write this is because while an apparently eccentric comment made by an apparently eccentric priest is inherently newsworthy, the person behind it often gets lost in the “And finally” jollity. In praying for Gadaffi, Fr Dinny cuts to the heart of genuine Christianity: if you can’t pray for the worst among us, then you’re missing the point completely. Regular readers will know I’m no great clericalist or defender of the faith, mainly because the Catholic Church has deviated so wildly from the original message of Jesus. A Church that literally claims to be “Universal” has become defined by the people and ideas it rejects. Men of God should be above all else compassionate, thoughtful and merciful. Thankfully, in Fr Dinny, we still have at least one.